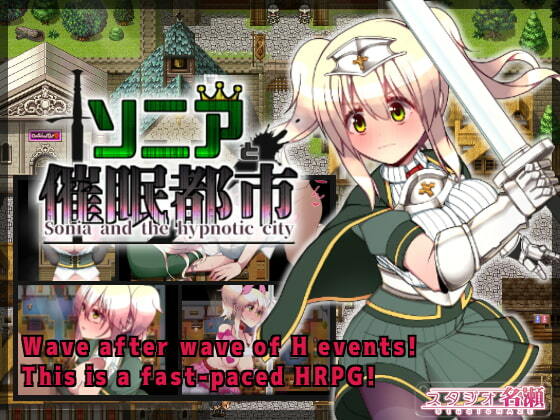 On a certain mission, a holy knight named Sonia visits a town, where "hypnotism" is widely practiced! Sonia struggles to save the town in the face of hardship! * There are over 36 H events! You will get a scene replay item after a corresponding H event so that you can see the H event anytime. There are bad endings but you can go back to the timing before it after seeing the H event. Also, the scene replay item of the bad ending will be given even when you avoid the bad ending. Designed to provide you a stress-free gameplay experience with message skip and auto messaging functions. Reminiscene/Scene replay room will be available upon clearing the game. An endgame save data is contained. Please enjoy H scenes on big 1280x720 size window! Real-time system log pops up on the left side of the window (please see the demo movie). Showing changes in heroine's state as logs is awesome, isn't it? "Log Fetish" if to name it? In the retail version, there is an option to "start the game from the end of the trial version"
so you do not have to repeat the same gameplay. * This game is created with RPG TKool MV. The game operation is smoother than the previous title thanks to improvements in background processing. The trial version is in Japanese only. The translation is very good, although I did find a couple of minor bits of text untranslated (locked door messages nothing important). As for what is good, the art is very nice; Sonia is very pretty. The game is easy and doesn't make you work for the adult content. There are a lot of scenes and hypnosis is a part of all of them. As for what I didn't like, I am not a fan of peeing and there's a good amount of that, wish it could be turned off but not a big deal. I mentioned the game is easy, maybe a little too easy because it's extremely linear. The game always tells you what to do, half the time it automatically takes you there without you walking there yourself. Kind of makes me wonder why this was even an RPG maker game at all, especially since there is hardly any combat and it's super simplified. It basically just tells you what ability to use. It's also worth noting that the heroine losing her virginity is unavoidable, I wish there was a purity route but oh well. The things I don't like aren't a big deal and overall I say it's well-worth the asking price if you are into hypnosis. This game has one trick up its sleeve - hypnotism - but it does it very well. Everything from "you don't notice the stuff that's out of place" to "you will behave in exactly the way I want" gets a chance to come into play. The escalation of the main character's treatment is well-paced and gives you just enough in each scene to make you want to progress to the next one. The combat is a bit of a weak spot, but only comes into play like 4 times in the entire game and is pretty quick to deal with.